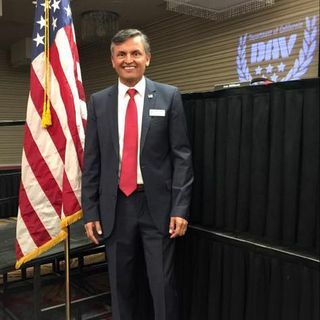 The CEO/Adjutant of the Disabled American Veterans – Department of California, Mr. Daniel Contreras finally joins the family on this episode of #YearOfTheVet! …and what an honor it is to have someone so involved with our community of veterans to have set aside the time to share his story with us! Those words set Dan down a long path of creating a legacy that the DAV has found itself flourishing in; as one of the nations’ most prolific Non-Profit Veteran Service Organizations. When Dan and I first met, within the first five minutes, he influenced me to be a better veteran—asking me to come up with a way to bridge the gap between our generations of veterans, and although the #YearOfTheVet podcast isn’t directly a result of that conversation, the fire in my belly to continually find ways to bridge the gap is a result… and #YearOfTheVet is a result of that fire. And I’m not the only person that Dan has worked his magical voodoo on. In fact Dan shares ways to positively influence individuals to do better, and get quality work done over quantity. He shares his mantra of how success is created, and talks about the importance of relationships. Dan and I talk about opportunity and legacy, culture and family. Dan shares the benefit of having veterans involved in each other’s lives, as well as a call for the community to get involved. Because… It Takes a Village. But it’s not all business with the DAV. The DAV also likes to host events and send veterans to go enjoy life, with each other as well as their families. Events like the Salmon Derby, hosted by the Monterey Bay Veterans Inc., Military Appreciation Monday at the Golden Corral, sending vets to learn winter sports via “Miracle on a Mountainside,” diving, driving, eating, camping, hunting, sending your kids away to summer camp at Camp Corral (https://campcorral.org/ )… the sky is the limit! There is a ton of great information packed into this conversation, and not to mention, Dan shares a lot of his story that you don’t normally hear from a leader at his level. I’m very honored to introduce to you, CEO/Adjutant of the Disabled American Veterans – Department of California, Mr. Dan Contreras.  (8:02) What makes Dan… Dan?  (13:27) What’s love got to do with it?  (15:00) The recipe to success.  (24:16) Why relationships are important: An ode to being good at what you do.  (27:01) When having enough pushes you to having more.  (30:07) Why consistency is key.  (41:39) Motivating individuals to keep the wheels of the DAV rollin’!  (44:56) TAKE THAT WEST VIRGINIA DAV!  (55:19) Are you a Californian Veteran??? Listen up!!!  (55:51) Who is going to continue the legacy? Is it you?  (59:42) Expressing the vision of legacy.  (1:14:05) My eyes are sweating. Are You a Veteran Who Needs Help?